We recently had the opportunity to attend this year's fabulous Architectural Digest Design Show on Pier 92 in NYC. But, before sharing all our favorites from the show, we wanted to take a few minutes to talk about art. "Who's afraid of the Contemporary Art Market?" To be honest, I wasn't certain that I was afraid of the contemporary art market, yet as Mayor Rus moderated, a rush of awareness and care gradually surfaced. Art is such a rich part of a home or office, yet it's not always easy finding and implementing art into a space. Collector, consumer, or advisor, we've pulled together a guide to engaging in the contemporary art market that will open your eyes in a new way the next time you set out to implement art in your home or business. Globalization has resulted in art that is accessible. That's a good thing! However, with accessibility comes a proliferation of art and unfortunately, an element of apathy. With a growing supply and availability of art, we run into the problem of not looking at all, or first looking at cost, or first listening to what other's see and say before you see and listen first yourself. "See art in a purer way." Look for yourself. Heirston does this by bringing her clients to a museum in order to get their reaction to a work of art. Without prices posted in a museum, she is able to give the experience of seeing art and understanding the influence that artwork has on a client before guiding them to select art for their home or business. "Be choosy and edited. You cannot do it all." There are countless art fairs, markets, and galleries the world over, and you will not be able to see them all. Push back against conformity of taste and what others say and see. Look for yourself. Technology increases the speed at which we do things. It's primitive when we begin to reminisce about life before the advent of computers and mobile phones and Amazon Prime! This is awesome, because we get stuff done so. much. faster. That rapidity is also concerning, because it can be blinding. We don't slow down to smell the roses. Instead, we live through the lens of our favorite Instagrammers. That's also not all bad, but it does cost us the practice of slowing down to see and look and dwell on beauty and art for longer than a hot second. There are a lot of great artists, but a limited amount of control over what artists are given viewing space. This creates a challenge with diversity in the broader art world, and results in a narrower lens through which we view and understand life. Looking at all kinds of art is a better way to see. “As ArtPrize matures, it’s become clear that it’s not enough for the event to be radically open. To truly engage all audiences, we need to be radically inclusive." As ArtPrize and other public art initiatives have shown us, there is a hunger for public art that often sparks complex dialogue and ignites economic and social impact. The more exposure to all kinds of art we have, and the more we take the time to look, the more we see and understand. Art is a complex and beautiful lens into the hearts and minds and souls of people around us. If you find a contemporary artist that you love, it's an exciting opportunity to celebrate their work. Both as a designer and a client, we can take a leap by handing over a room to an artist. We saw interior designers, Phillip Thomas and Garrow Kedigan take that risk at Kips Bay Showhouse last May with outstanding results. 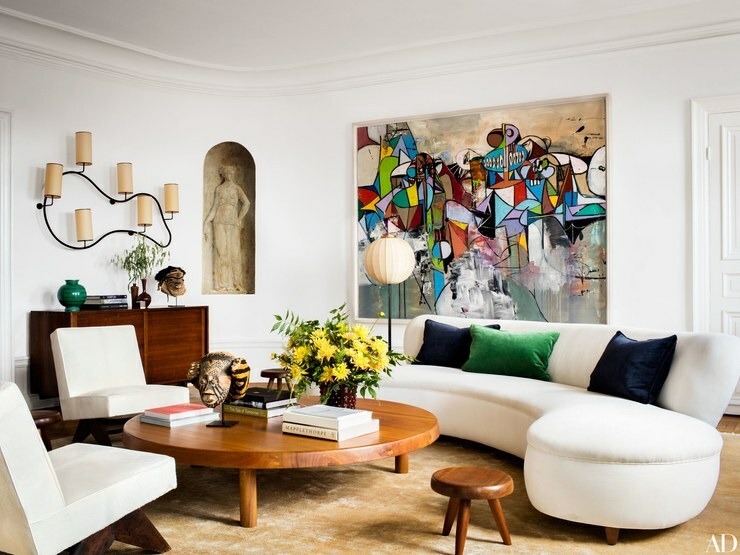 Decorating with art can be an integral and inspiring part of a design project. When art is dismissed or overlooked, the space suffers. Instead of living with art that feels flat, making it a central part of your environment can bring a room to life.